We have a local vinyl store in the area so I went and got 2 sheets of every single color they carried which ended up being around 30 different colors, so 60ish 12×12″ sheets. Then, in my Silhouette software I created 6 different pages of animal silhouettes. I just google searched random animals and used the trace feature until the page was full. I did that until I had 6 pages of different types of animals in different sizes. I had the kids help me think of both common and obscure animals. Then, making sure we didn’t have two colors of the same animal sheet, I fed them all through and cut them out making approximately seven billion stickers… kidding. But there were A LOT! Fun Fact: because I only had 2 sheets of each color and made sure not to cut the same page in the same color… no two animals on the wall are alike! When I started placing the animals on the wall I made sure to spread out the big animals so I started with those and filled in with little animals as I went. I also ended up cutting some of the vinyl stickers in half on the edges of the walls and door (both horizontally and vertically) to make it look more wallpaper-like. Once I finished the big animals that needed 2 hands the kids pitched in and helped. Who doesn’t want to spend a Friday night applying 800 stickers to a wall am I right haha?? But honestly it was very easy and I absolutely LOVE how it turned out… and I love that it was all under $30! I knew the wall would be the bright focal point of the room so I didn’t want to go too crazy with the accessories, I tried to stay as neutral as I could :). I DIYed the “mexican pancho” pillows from an old costume we had lying around and I found the Otami pillow on amazon. I will link all sources at the bottom of this post. I’m really in love with this bed too! It has a vintage feel but it’s brand new (from Walmart of all places). It was super affordable but it’s very sturdy and seems really well built… I highly recommend it! This room has a funny layout because of where the bathroom door is on the wall so I was left with one more skinny area and a huge open wall. Besides animals my son’s other loves are legos and art. He is very creative so I thought a long skinny desk with a pegboard wall would be a great use of space. My father in law cut, sanded and finished the wooden top piece of the desk for us. Then I just got two little end cabinets and the board is just siting on top of them. He also framed out the pegboard and painted it white for us. I got most of the pegboard accessories from Amazon and Ikea. The desk is a huge hit, in fact all three kids love it and they are often all in there coloring or drawing together! I should have bought 3 stools instead of 2 haha. I needed something on the left of the pegboard wall so I drew my son’s favorite animals (inspired by some prints I had seen on instagram) on my iPad Pro, sent them to a local print shop and had them printed in poster size. The last little area was all I had left for a small dresser so I was so happy to find one that fit the dimensions I needed! I’m telling you, this room design is weird. It had to be shallow enough to fit behind the closet door but short enough to fit under the window sill… tough job! I also left the Ikea book rails up from the playroom days because I still love them! I found this rug at Target and although it’s a little grown up for a boy’s room I thought it went really well in here. One good thing is it camouflages stains well haha! The baby of the family started school… kind of. It is just two mornings a week but she loves it, I love it… everyone is happy :) But she definitely needed a First Day of School Dress! My friend owns a Garnett Designs, a monogram and vinyl company (she ships so look her up) and she posted a cute little apple monogram and I just knew that Bee needed it haha! She had it on a white tee which was super cute but for some reason I needed it on stripes. As for the pattern, it’s the Pippa Peplum Top by See Kate Sew with the Dress Add-On. I have made this pattern a ton of times and I LOVE it! Seriously one of my favorite little girl patterns. Sometimes it’s hard to find patterns that are this simple, they all have ruffles or sashes or embellishments… which are great but we aren’t super girly girls over here. The dress add on bundle is so worth it, I have never actually made this as a top, just the dress. This is the “gathered dress” version, I also love the “circle skirt” version… which I made HERE. I know apples are kind of a “back to school” thing but I’m hoping they can also cross over into fall too right? Let’s say that they so because I just love how this one turned out, crooked stripes and all! I hope everyone has a great year and thank you Mary for the amazing apple monogram! When I found out I was pregnant last year I was of course thrilled for a new little bundle to join our family. Soon after it sunk in, I got super excited to do another nursery! We didn’t find out the gender with either of our boys and they were so close in age that I just used the same nursery for both of them. It was gender neutral and of the “pre-pinterest era” so I have had years to collect ideas and get inspired :) I already knew what I wanted long before I even knew the gender so when I found out this girl was a girl… I knew a dot wall was happening. I know I’m a little late to the gold-vinyl-dot-wall-party but I still love it, so I thought it would be perfect for the wall behind the crib. I have seen the gold dots randomly placed on walls and while I do love random I wanted a pattern this time. I searched and searched for a tutorial on how to get THIS LOOK in my inspiration photo but I wasn’t able to find much. I called for backup, my mom and sister. I’m sure there are many ways to achieve this look but this is what we did. I bought gold sticky vinyl online and used my cameo to cut 1.5″ dots. I have the silhouette file saved, if anyone wants it let me know. Other than my dots, I used these supplies: a ruler, tape measure, piece of cardstock, scissors, some very sticky double sided foam tape and a pencil. The other must have tool is a laser level. I found this one at Home Depot for around $8. The whole trick to getting the pattern to look like a pattern is getting straight lines on your wall, enter the laser level. I’m sure you could also use other methods like an overhead projector, use a regular level with a tape measure and pencil, pop a chalk line, etc. But I really liked this little tool. We used the double sided foam tape on the back which needed to be changed every few rows. Once you get it taped it up it rotates 360 degrees so you can get it lined up correctly after mounting it to the wall. There is a level on the back but it wasn’t super accurate because of you move it just a hair the line at the end of the wall moves inches up or down! For the first row we started measuring from the ceiling and made a pencil line 6.5″ down on both sides of the wall. For the other rows we measured from the previous dot line. Then we just played with the laser until the line was touching both pencil marks on both sides of the wall. This is a very hard picture to see but the laser line on the left is below the pencil marks so you have to play with the laser until the the line is perfectly on the marks like the picture on the right. As far as the spacing on each row we also spaced the dots 6.5″ apart. Instead of holding a ruler or tape measure between every dot we measured a piece of cardstock and used that as the ruler. We measured 6.5″ from outer edge of each dot and made sure the top of the dots lined up with the red laser line. After you get your first two rows up, its pretty easy. A few other tips… every other dot on our left side had to be cut in half. And I did have one dot that I had to put under the power outlet plate. I really love how it turned out and I can’t thank my mom and sister enough! We worked one night from about 2-3 hours then I finished it up the next afternoon so it was a pretty quick project. The most time consuming part is getting the level lined up but I love the patterned look so it was worth it! Here is a little peek at the crib. I will have the details on the bedding and quilt next week. Last night, after sulking all day about my crafting slump, I crawled in bed with my copy of Martha Stewart Encyclopedia of Crafts (best book ever). I think I am healed, I knew Martha would help! I remembered something I have been thinking about – of a Chevron Striped Plate. Let me explain, I have a plate collection on the walls of my dining room, they all mean something and they all have a story. I even have two plates from two of my great-grandmothers, one of which is handmade. I thought a modern looking Monogrammed Chevron Plate would really give the wall a fresh “springy” look. I wanted to do a Chevron Stripe on the background of my plate but any graphic pattern would work. I, of course used my trusty Silhouette! First of all you need to clean your plate so the vinyl will stick. Measure the center of your plate making sure to measue the curves of the plate too. Mine was a little over 10″ so I made my chevrons 10.5″ long. In my Silhouette software I used the chevron shape (which was the free shape of the week a few days ago) and loaded my premium vinyl into the machine. About the Monogram… did you know that you can search “free fonts” in google and there are millions of fonts that are way better than the stadard loaded on your compuer. All you do is downloard them to your computer, then install them and they will show up in all of your programs like Power Point, Word and your Silhouette Software! So, I searched for a free Monogram Font and found the perfect one. Here is the link. Make your last name inital larger than the other two initials because that will be the one in the middle. 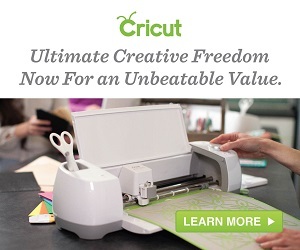 Load your bright colored cardstock and cut! I have no scientific instuctions on how to place your vinyl, if you are a perfectionist I’m sure you could measure but that is just too hard for me. So I eye-balled it. Just make sure to get out all of the air bubbles. 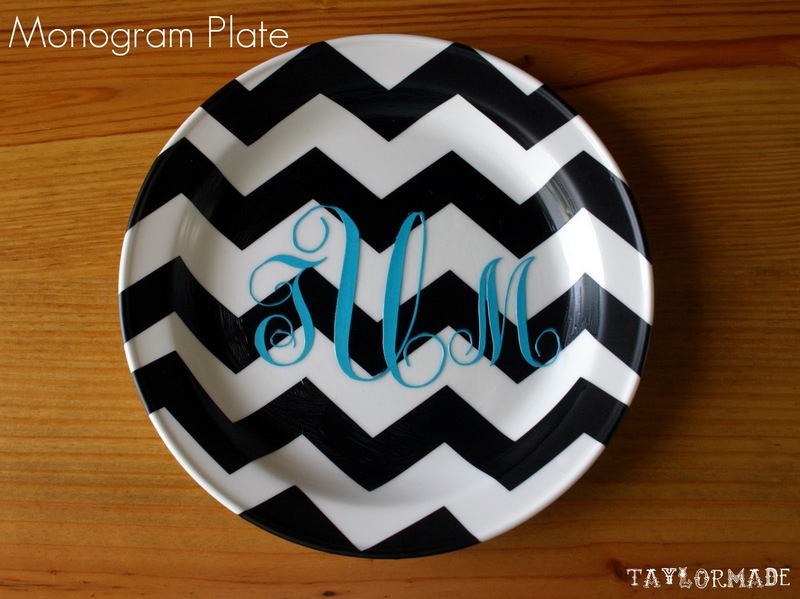 Apply a thin layer of Mod Podge down on the plate. I didn’t Mod Podge the outer ring of the plate. I used the Matte finish because it’s my favorite. Carefully place your letters down, make sure they are all pressed down well by using a pin or tweezers and get out the air bubbles. Apply a top coat of Mode Podge to the inner curcle of the plate. Make sure to get in between all of spaces in the letters and again, pop the air bubbles with a pin because they will dry funky if you don’t. Now just wait for your plate to dry, and hang that baby up, it looks so profesh!